User experience (UX) has been a buzzword for so long that its exact definition has become hard to nail down concretely; it’s still ubiquitous in the industry (and even beyond), but it often holds different meanings for different people. The general confusion around UX is further compounded by the exponential growth of the new digital frontier we live in. The roles and responsibilities of a UX practitioner have been rapidly transforming to keep pace with the ever-changing digital evolution. So what is UX really? How has UX changed over the last 20 years? How does UX fit into a modern, product-centric organization today? How is UX practiced now and what does the future hold? Do UX designers really have cyborg brains and robotic appendages? 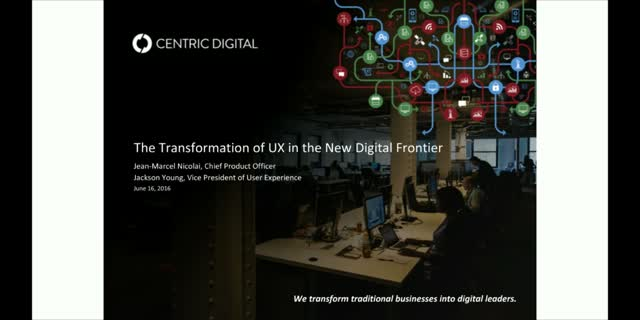 In this 45-minute webinar, Centric Digital’s Jean-Marcel Nicolai, Chief Product Officer and Jackson Young, VP of User Experience, will answer the above questions and share their insights about UX discipline’s past, present and future. Jonathan Allen, President of L&T Co.
Jonathan Allen, former Director Of Search Engine Watch and founder of Longneck & Thunderfoot, shares case studies and personal insight into what elements he thinks will make for a winning marketing strategy in 2017. Exploring both paid and organic digital marketing strategies he'll share how to take a blended approach to maximize the benefits of each and have data from paid and organic channels influence each other. Cooper Pickett, CEO - L&T Co. Learn some of the best tried and true tactics and how they combine with L&T's new school thinking on building business relationships online. Criteria for Success has spent the last 16 years transforming sales systems and increasing sales performance by at least 25% for the organizations they help. They recognized early on that busy sales executive easily forget that new customers and clients are right under their nose. CFS have identified Social Selling as key to reaching to these buyers and accelerating sales growth. And that intuition is now supported by data: according to a Forbes report, 78.6% of salespeople that used social media to sell out performed those who didn't use social media. Join us to learn how you can combine standard tools, such as LinkedIn and Salesforce, with a simple process to create a winning Social Selling PlayBook. It's official: it's 2016 and Content Marketing is here to stay, especially for B2B brands. From startups to international corporations, from the most well-known brands like Coca-Cola's blog "Unbottled" to niche companies looking to reach (and teach) new audiences, executives are turning to content. But not just any content will do; readers are more discerning than ever, and only content that provides value to the people you want to reach will get the job done. But how do you provide content that really adds value to your customers? Catrinel Bartolomeu, Head of Content at Oz Content, shares six of her favorite content marketing ideas for B2B marketers. These ideas will help you stand out from your competition, improve your SEO rankings, and attract new clients. Want even more insight? Catrinel will answer audience questions live-- all you have to do is tune in and ask. What makes a great Olympic ad? What’s the play by play to launch content effectively? Join Unruly for emotional marketing analytics, based on the best Olympic ads of all time, and our 10 tips to medal in Rio. You’ll learn which emotions dominate the games, optimal launch timing and, and how sponsors and non-sponsors can win gold (in audience reach and engagement)! We’ll analyze recently released Rio ads using Unruly Pulse and Unruly Custom Audiences to visualize emotional metrics, and the brand and business metrics they drive. We’ll show you how to use this data to target the consumers who love your ad best, and how to create ads that will consistently win the hearts and minds of consumers. In this webinar we will explore what’s happening in the world of chat bots and what benefit they can be to your apps - and we’ll even look at how to create one yourself. Given that 90% of users’ time on their smartphones are spent on apps, getting users to your app is becoming more important than ever. But what users like most about apps can be accomplished in a more intuitive way: David Hu, VP of Engineering at Dexter, notes that transactions in apps are essentially call/response transactions: why not streamline the experience with a bot instead? Furthermore, messaging apps have a larger Monthly Average User base than social networks, and the trend is just kicking off. Distimo found the 91% of top companies have apps, but as Facebook’s bet on bots suggests that bots are poised to become a major player. Marketers have always had to figure out their clients’ message; now they just have to figure out how a bot will say it. Dexter is a platform that enables people to build meaningful digital experiences by connecting services across the web. David Hu is Dexter's VP of Engineering and is currently leading efforts to build better tooling for chatbot creators and partnerships to allow builders to connect even more services on Dexter. Marketing is ever-changing and ever-evolving. We bring together leaders across fields for fireside chats, informative presentations, and roundtables on a variety of topics that marketing professionals care about.